The Texas Perimeter Ride is finally underway. By design we will only travel about 300 miles a day mostly off major highways. 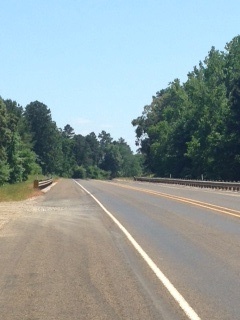 We left out of Houston on I-10 East Hwy 90 East and meandered our way up to 770 to Kountze. I must say I have lived in Texas my whole life (less a few years here and there) and never realized the awesomeness of East Texas. Usually we are running up and down I-10 or Hwy 59 on a mission trying to get somewhere fast and never really taking the time to really enjoy the scenery. Well, today we did just that and it was beautiful. The scenery along the highway reminded me of the Carolinas. It was weird. The Big Thicket was the first planned stop. What a great name for a great place and maybe the name of my next book. Who knows? Anything’s possible, right!. The Big Thicket National Preserve is located in Kountze, Texas. It just so happens that my dear friend Lisa Read is from Kountze so before I go on here’s a shout out to Lisa. Hey Lisa! Loved your hometown! The Big Thicket lies on the coastal plain of Texas and is crossed by numerous small streams. It is referred to as a biological crossroads. It once was the most dense forest region in Texas but deforestation dramatically reduced its size. Today the area contains over 100 species of trees and shrubs. 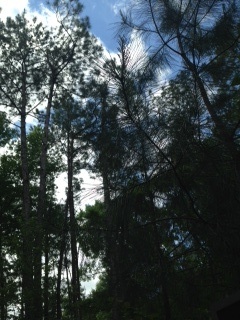 The most dominate tree being the Longleaf Pine which reaches heights of over 98 ft. There are lots of activities to participate in while visiting the Big Thicket. You can kayak, bird watch, fish, hunt or canoe. A bus load of children showed up while we were there to hike one of over 40 miles of hiking trails on the property. Unfortunately, we weren’t able to do any hiking today but we’re definitely going to return another day and take advantage of the amenities. We didn’t travel through the thicket at night so we didn’t get an opportunity to witness the Light of Saratoga. Looks like I’m going to have to come back for that ghostly experience. Here’s an interesting fact I thought I’d share with you. Millions of years ago, much of The Big Thicket was underwater until the shores of the Gulf of Mexico receded to its current position. Now that’s certainly something to ponder, huh! 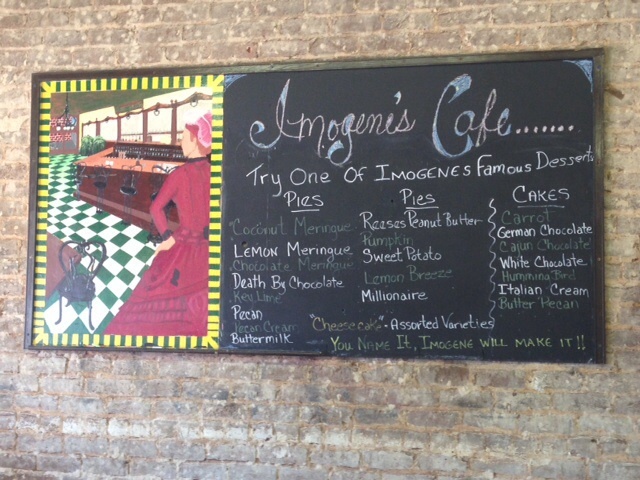 Next stop was San Augustine for lunch at Imogene’s Cafe. Let me just say this about Imogene’s. If you are ever remotely close to this place you have to stop in for lunch. Check out this dessert menu. It had every dessert I ever wanted and more. 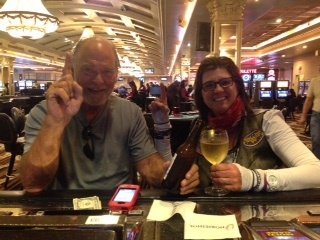 After leaving Imogene’s we decided that since we were so close to Shreveport LA why not stop in at the Horseshoe Casino for a night of gaming. We called it a day and can’t wait to start over again tomorrow. Check out the bad hair day. Yikes. This entry was posted in On The Road Again and tagged ghost stories, Kountze, Longleaf Pine, motorcycle travel tips, ride around Texas, Saratoga, Saratoga ghosts, Texas ghosts, Texas Perimeter Ride, Texas Perimeter Ride on motorcycle, The Big Thicket. Bookmark the permalink.